High Pressure Fog Systems have been used for decades on a wide variety of projects but there are a few ideal applications where fogging should always be considered. The HVAC system for a lab uses multiple make-up air units (MAU’s) which can utilize a fog system to humidify all of the air handlers with a single pump unit. This greatly reduces the capital expense and a secondary pump can provide redundancy if required. 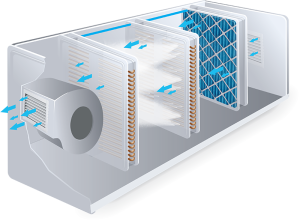 Energy Recovery Coils (ERC’s) are typically in place which will help offset some of the evaporative cooling that occurs when the fog system is running. An additional set of fog nozzle manifolds can be placed just upstream of the exhaust recovery coils to evaporatively cool the air to near saturation which can provide an additional 10°F or more of precooling during the summer months when the fog system pump is not normally operating. Printing, Woodworking, and Textiles are just some of the many different manufacturers requiring humidity control for product stability and static control. Fog nozzle manifolds are installed directly in the space at the ceiling level and run the length of the building in the aisle ways. Fogging directly in the space provides the required humidity control while using the wasted heat at the ceiling to evaporate the fog droplets. This can humidify an entire manufacturing plant with a fog system pump that is less than 5 HP! Static control for a data center is vital and maintaining the proper humidity level plays a key role in achieving this. Since the servers make an excess of heat, it makes sense to use this wasted energy if it at all possible. So why would you install a steam boiler to raise the relative humidity when there’s a better way? A fog system in conjunction with an air-side economizer will use a portion of this heat to offset the cooling effect that occurs when fog droplets evaporate. Since a fog system requires less than 0.003 kW per pound of water evaporated, it provides precise humidity control while lowering your PUE (power usage effectiveness). Most commercial buildings take advantage of air-side economizers which provides free cooling during the transitional seasons for its HVAC system. This is a textbook application for fogging. As moisture is added, the evaporative cooling effect is offset by the heat in the return air. The supply air temperature sensor will modulate the amount of return and outside air as the fog system stages to maintain the humidity in the space. A fog system also provides free cooling so the amount of outside air will be greatly reduced. Since the humidifier load is mostly based on the amount of dry outside air being introduced into the building, the load is smaller when fogging is used versus steam. Thereby using less water while operating at a fraction of the cost of a traditional steam boiler. Many considerations are involved during the design of a greenhouse, conservatory, or botanical garden. Near the top of the list is selecting the best method of how to cool and humidify the space while also considering overall maintenance and energy usage. A fog system is commonly employed as it checks all the boxes. Each fog system is custom engineered to the exact needs of the client and the tiny fog droplets evaporate quickly which provides the ideal growing environment without any wetting of the product. This increases production, reduces waste, and enhances product quality. All while using very little energy and with minimal maintenance.